Get a special price on the SMOK Stick Prince vape pen from VaporDNA.com. 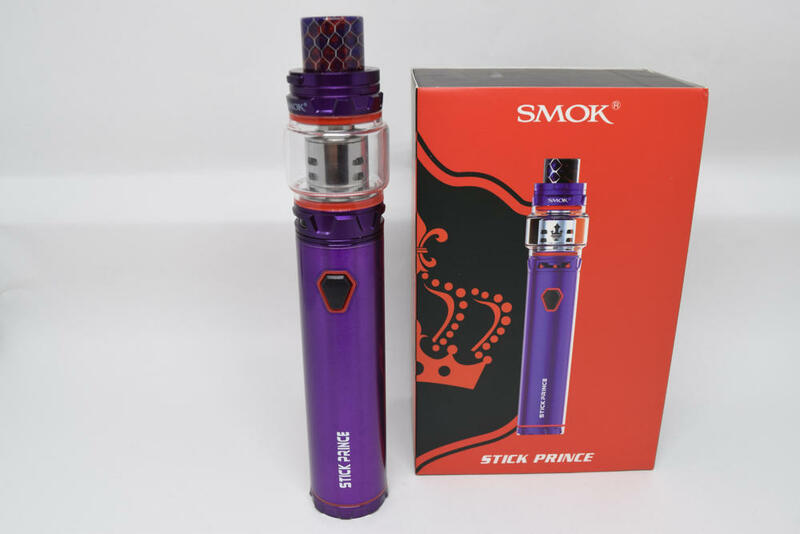 The Smok Stick Prince kit is a simple yet powerful all-in-one package aimed at intermediate users looking to move up from their basic vaping devices, but who are not yet ready to tackle complicated features like variable wattage and temperature control. The Stick Prince basically offers the best of both worlds – wonderful simplicity and extreme vaping performance, which should definitely make it one of the best-sellers of 2018. 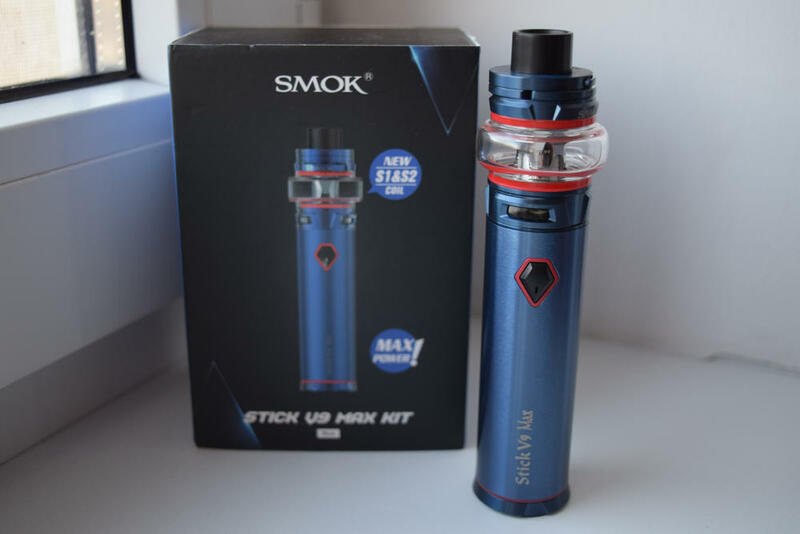 The Stick Prince comes in the standard Smok packaging, a rectangular cardboard box with the assembled device on the front, next to a large crown logo, and a laudative description of the kit, a list of contents and the usual legal warnings, on the back. This is pretty much the same packaging that Smok has been using for all of its products since as far as I can remember, and for good reason. They have some of the best quality packaging I’ve seen, and although it doesn’t affect performance, it definitely makes a great first impression. Inside the box, we have a black Styrofoam holder with the Smok Stick battery sitting next to the company’s current flagship tank, the TFV12 Prince, and one of its most interesting coil-heads, the M4. There’s another coil-head already installed in the tank, so you get two of them. Under the holder we also have a micro-USB cable for charging, some gaskets and o-rings for the tank and a user manual. 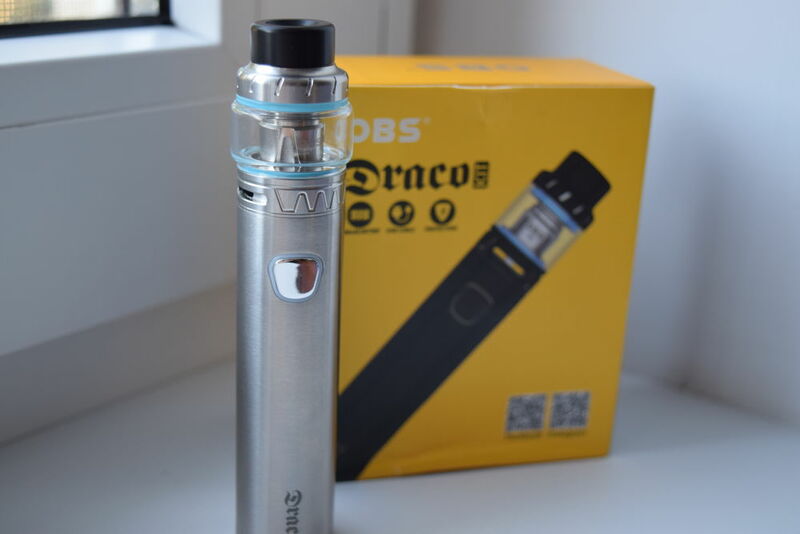 Unfortunately, Smok didn’t include a spare glass tube in this kit, and that’s kind of a big con, especially since the TFV12 Prince comes with a bubble glass, which is very prone to cracking in case of accidental contact with tough surfaces. Adding an extra glass may have bumped up the price a little bit, but as someone who has cracked many tanks over the years, I can honestly say it would have been worth it. Generally speaking, the Stick Prince is very similar to Smok’s previous Stick systems, like the Smok Stick One Plus, or any other modern stick kit for that matter, but the TFV12 Prince really makes it stand out. 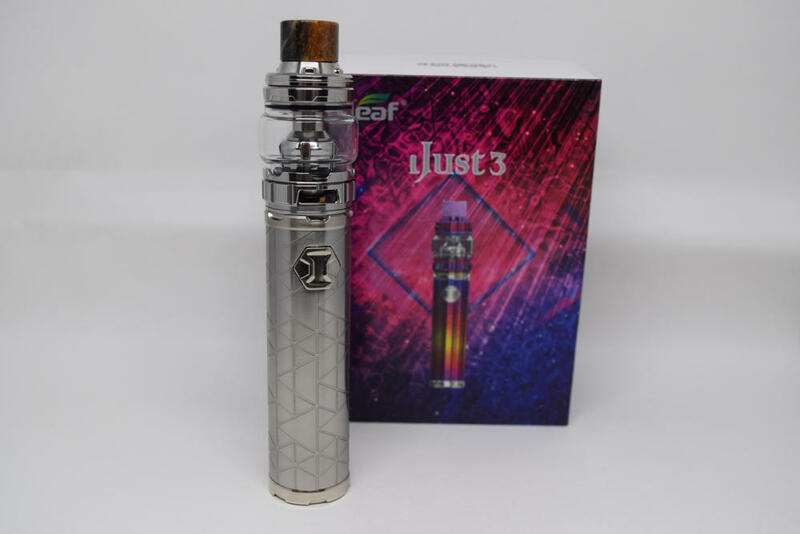 For one thing, it’s a visibly larger device than all the other sticks I’ve seen in the past, both in length and girth, and just the bubble glass and snakeskin resin drip tip of the tank are really eye-catching figures. 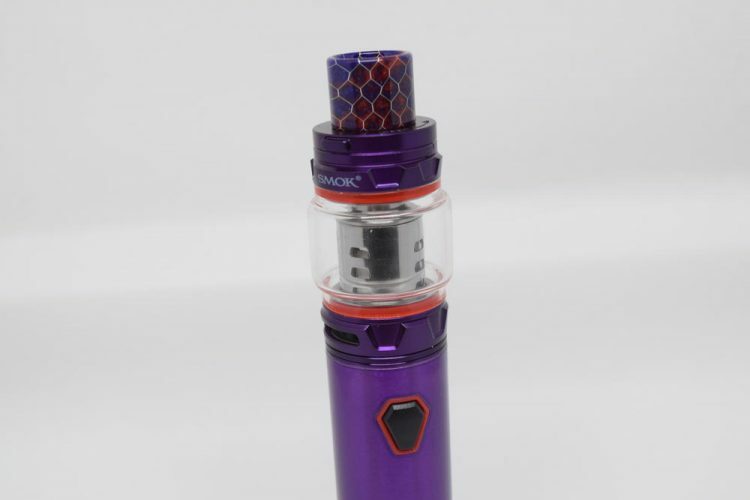 The assembled Smok Stick Prince is 148mm long and has a diameter of 24.5mm around the battery and 28mm around the bubble glass section. It’s not the stealthiest vaping device out there, that’s for sure, but thanks to its cylindrical shape it’s very comfortable to hold and fits into virtually any type of pocket. Also the girthy battery has a 3,000mAh capacity, which is by far the largest I’ve seen on a stick vaping system, and the TFV12 Prince tank is already famous for its vapor production capabilities. Design-wise, there’s really not much to comment on. The cylindrical battery features a standard 510 connection at the top, a shield-shaped fire button with an LED ring around it, a micro-USB port for charging, and a small vent hole on the bottom. The tank, on the other hand is a bit more complex, as we are, after all, talking about Smok’s most advanced sub-ohm tank to date. 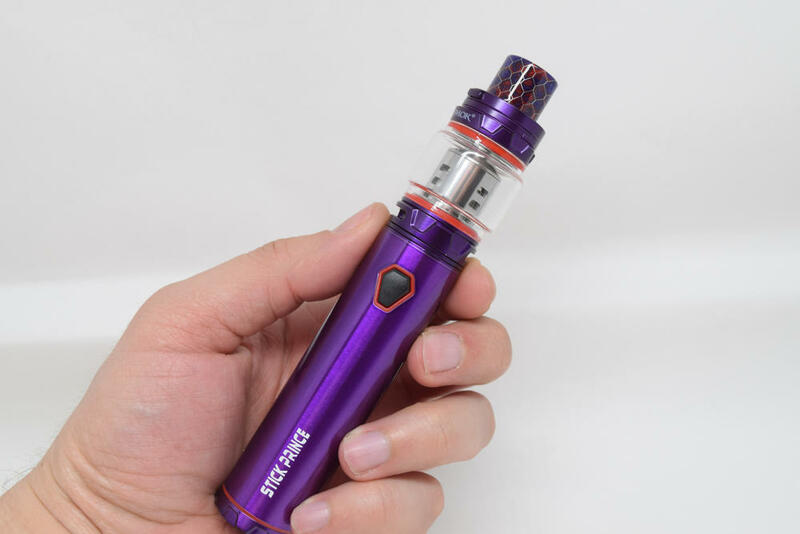 Luckily, the user manual does a good job of explaining how to refill the tank, change the coil or remove the glass for cleaning, so even beginners should find the Stick Prince easy to use. Using the Smok Stick Prince is a fairly straightforward affair. There’s no settings menu to go into, no power adjustments that need to be made, you just fill up your tank with e-juice, let it sit for a few minutes and then you’re good to go. Press the fire button five times in rapid succession to turn on the battery, and then press it again every time you vape. It’s that easy. The Stick Prince may be a rudimentary device, but it does have all the necessary built-in protections to keep user safe in case something goes wrong, like short-circuit protection, low-battery protection or overheating protection. You have to keep an eye on the LED indicator around the fire button, as any number of flashes indicate something else. The same goes for battery life. Every time you take a puff, the indicator will flash four times, but once it reaches a low enough voltage, it will stop firing at and the LED lights will flash 15 times letting you know it’s time to recharge. The TFV12 Prince tank is definitely the star of the Smok Stick Prince kit. It’s the latest addition to the now famous TFV family of tanks, and many are saying that it’s actually the best yet. Having used all of the other ones, starting with the TFV4 all the way to the TFV12 Cloud Beast King, I can definitely sense an improvement on the Prince, especially on the flavor side of the vaping experience, where the previous tanks suffered. 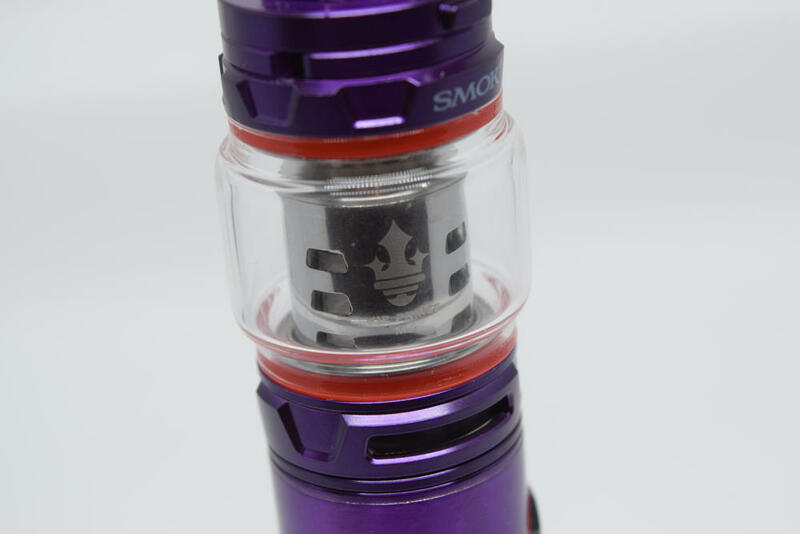 The TFV12 Prince has a diameter of 24.5mm around the base and top-cap, and 28mm around the bubble glass tank. Having the glass section protrude from the rest of the body is both a good thing and a bad thing. On one hand, you have an e-liquid capacity of 8ml, which is a lot more than what most sub-ohm tanks these days can hold, but it also increases the risk of cracking the tank in case of accidents, because the tank is more exposed. Smok’s flagship tank features the same swivel-style top cap as the other TFV tanks, only this time around they’ve also added an unlock button that you have to press to unlock the cap. In the past, some user complained that the top cap on their tanks came loose on its own, so this is a fix to that problem. The base of the TFV12 Prince tank features two large airflow slots with a rotating metal ring that you can turn to gradually open or close these slots. On the base, we have a non-adjustable, silver-plated 510 pin that protrudes from the threading quite a bit. 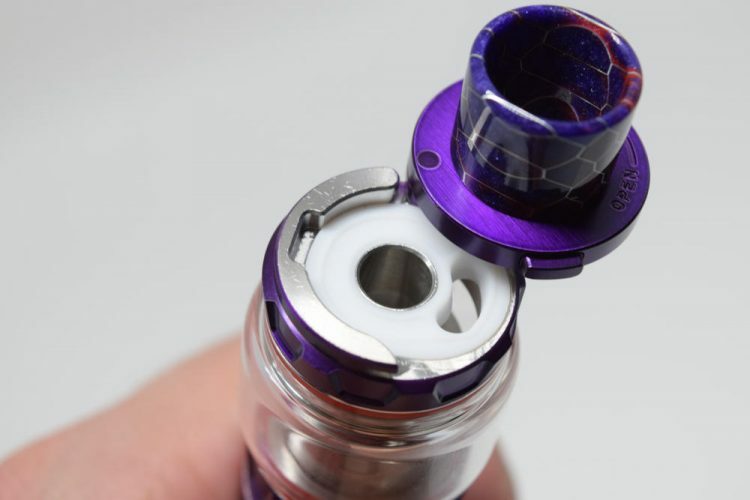 To change the coil-heads, all you have to do is unscrew the base of the Prince tank, unscrew the coil-head and just install a new one. 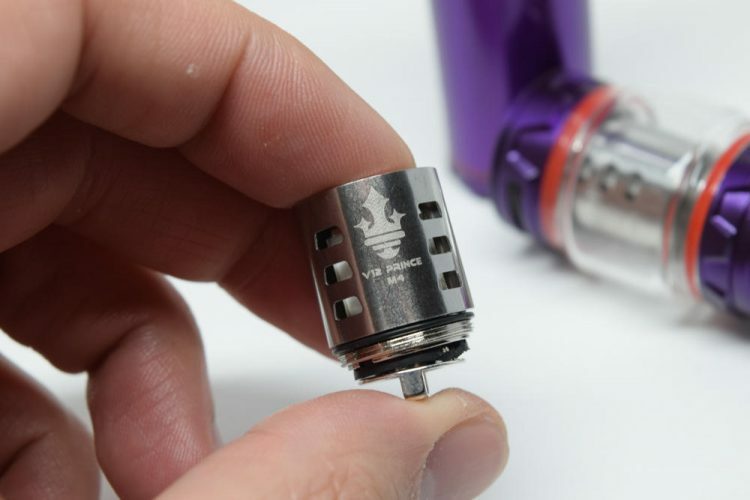 It’s a very easy process, and thanks to the tank’s three piece design you don’t even need to empty the tank before changing your coil-heads. The Smok TFV12 Prince currently has several lines of compatible coil-heads, but for the Smok Prince Stick, the Chinese company only included two M4 series coil-heads, 0.17Ω resistance. In case you didn’t already know, the ‘M’ stands for ‘Mechanical’, which is what these coil-heads were designed to be used with. Since the Stick battery doesn’t offer any control over the power output, it behaves like a mechanical device, so these coils were the optimal choice. I would really suggest sticking with the M4 coil-heads, at lest on the Prince Stick, as any other model will probably not perform as well. The Smok Stick Prince battery has a capacity of 3,000mAh, which is really impressive for this type of vaping system. While using the Prince exclusively, I got about 6-7 hours of use out of it, before the LED indicator let me know it was time for a recharge, which is not too shabby for a stick device. And I consider myself a heavy vaper, so a casual user should get a bit more vaping time, maybe even a full-day’s worth. However, one thing I did notice while using the Stick Prince was that after 3-4 hours of use, or around half-way through the battery, there was a noticeable decrease in power output. This is completely normal for an unregulated vaping device, but I felt it was worth mentioning so you don’t think that there’s something wrong with the mod. The voltage just drops after a while, and you won’t get the same fluffy clouds of warm vapor that you did with a full battery. In terms of performance, the Smok Stick Prince was definitely the most impressive stick system I’ve ever used. The vapor production is incredible, especially with a freshly charged battery. The flavor is a lot better than it used to be on the older Smok TFV tanks, as well, which I assume has to do with the new M4 coils. I don’t know if it’s those large wicking slots, or the fact that the coil-heads are much closer to your mouth this time around, but the flavor is definitely much more intense. The most impressive thing for me was that I experienced no leaking issues with the TFV12 Prince. I had some issues with Smok tanks in the past, and I was definitely not the only one. However, apart from the condensation that sometimes formed on the bottom airflow slots, the tank was as dry as a bone. Now, I’m not saying that the TFV12 Prince tank doesn’t leak, just that mine hasn’t, so far. Smok hasn’t exactly been the most consistent company as far as the quality of the coil-heads is concerned, so if you experience any leaking issues, I strongly advise changing the coil-head. If that doesn’t help, try replacing the o-rings on the bottom of the tank as well. All I’m saying is don’t write it off as a leaker, as most often than not, it’s the coil-heads or a chipped o-ring. 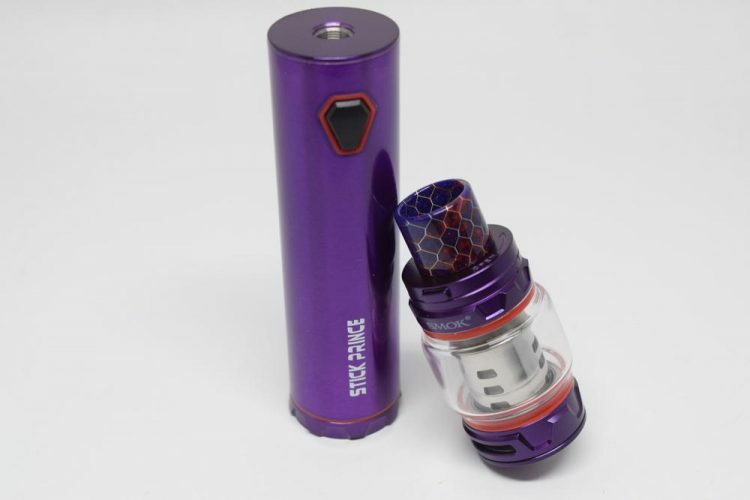 The Smok Stick Prince definitely has the makings of a huge hit, maybe even of the proportion of the Alien 220W kit. It’s as simple to use as an entry-level vaping device, has the performance of an advanced vaping device, and the price is not too shabby either. Vapesourcing is currently selling the Smok Stick Prince for just $28.90. Considering that the TFV12 Prince tank, by itself, costs $23.90, I dare you to find a better offer anywhere else. mine is only a day old and i have adjusted it and it is still strong, but is working . What can I do to make it better? The only issue I have experienced is how quickly the coils burn up… I have tried every coil designed for it and they all burn up within 2 to 3 days. I would seriously like to know how you are 6-7 hours battery life. I am getting maybe 2. I LOVE my Smok Prince Stick!!!!! I have had it for 38 days and have done a coil and total cleaning (glass) for maintenance and it is going strong! I turn it off between puffs to save on the battery and charge every 24 hrs. and am careful not to over charge it. I highly recommend this awesome vaping device!! Hello I brought My To Day But I’ve Got One Problem With It I Cart Use It As It’s Not Charging Up I Click It 5 Time’s When The Red Light Gose Out I Left On Charge Over A Hour I Went To Use It But Nothing It Just Flash When I Go And Prest The Button To Have A Smoke. So I Give It One Star As I Wish I Never Got It But Taking It Back To Shop And See What They Say About It The Vaper Pen. Has Any One Had This Problem With It……? Junk.. Firing button is stuck down after 3 days of use. I had mine for almost 3 weeks I love it but was filling up the tank and theres a hole that melted through the glass..weird I never seen anything like that before and no I did not drop it.I’m taking it back!! Bought mine a month ago. Today it won’t take a charge. Got a new one, and it won’t turn on. I’ve only had mine for 3 days, no leakage, great hits! Not getting nearly as good of clouds as I got when it was new. Coils burn out so fast too! Great overall besides the performance drop. I have had leakage problems because of the way the tank is designed to open. I have absolutely LOVED my Smok stick prince TFV 12. I have been using my first one for 10 months. During this time I have had issues with leakage and the upper device getting too hot to continue using. After researching for leakage issues I have learned to manage leakage problems. So very sadly my first Smok TFV12 has died today. It stopped blinking the red indicator light no longer shines red when plugged in to charge and it will not charge at all. . The little red light does not show its charging and now without having a charge is kaput. Thankfully I have another Smok TFV 12 still working and this one is accepting full charge, red light shines when plugged in for charging so I know the cords are not the problem. Unfortunately I find very little information about this problem . I found one video clip that displayed taking stick apart, cleaning both sides then reassembling this did nothing. The second post information on this in reviews was to thump battery in your hand until it works. I plan to research more before trying the thumping remedy. Because my second Smok TFV 12 is working well and charging with the USB cords, The charging indicator light shines red when plugged in and Smok TFV 12 charges promptly so I have eliminated possibility that issue is caused by cords. The are working fine.The USB cords provided in starter kit were very short, poor quality and quickly needed replacement within 30 days after purchase. If anyone knows how to remedy the anti-charging problem I would be so very grateful if they posted the remedy or a link to more information on this problem. Thank you all for taking the time to read and consider my problem. Cheers!